After the launch of the new S9III and S7, STONEX Europe introduces the new S8 to complete the family of GPS/GNSS receivers, therefore expanding the range of products on which the company has decided to invest deeply. The Topcon Group has expanded the offerings for its MAGNET Office software suite. MAGNET Office now includes optional Topo, Site, and Site with Resurfacing modules. Pitney Bowes Software, a global leader in customer data, analytics, communication software and services, today announced the launch of MapInfo Professional 11.5, an enhanced version of the market-leading location intelligence product. The Leica Zeno 5 has just been launched as the latest addition to the Leica Zeno GIS line of surveying instruments. 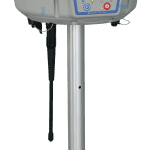 Sokkia Corporation announces a redefinition of 'robotics’ with its SX series of total stations, a compact, lightweight system containing the most modern technology available in the marketplace today.